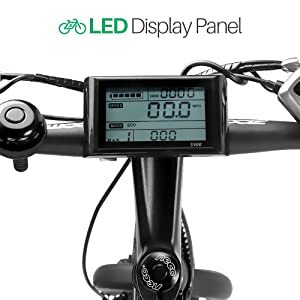 The Blue FAT26S900 series features the 500 Watt Rear Hub Motor with a 36v Lithium Cell battery to provide riding distances of 30-54 kilometre per charge. The bike features both pedal assist and throttle only mode and can roll over all types of terrain, thanks to the 4” tires found on all our fat bikes. It allows riders to ride along the sand, mud, dirt trails, snow and regular road conditions with ease! Get ECOTRIC®, go further, and have more fun with the price under $1,000! Max speed 20 MPH. 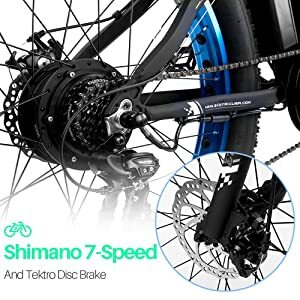 Shimano 7 Gears Shifting System for Fat Tire Ebike ONLY---Fast,Smooth and Accurate. 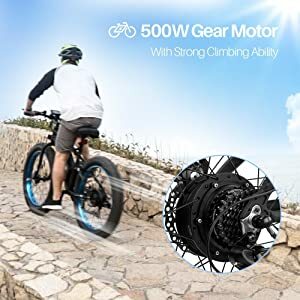 Strong driving Ba Fang force 500W Rear Hub Motor Battery: The removable 36V/12AH Lithium Cell with smart lithium battery charger. 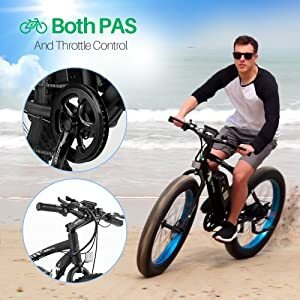 90% Pre-assembled we pay great attention to every detail of each component, ergonomic handbar, adjustable seat and anti-slip wear resistant tire. Cruise Control,can set the speed limit. The 500 Watt motor that is powered by the 36V battery. 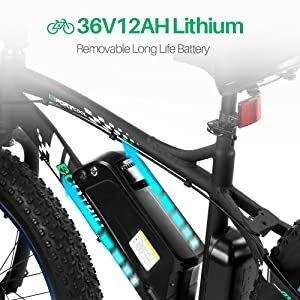 Battery runs out to fast it only last about 1 hour no even 15 miles to have the bike for a long time you need to have at list 4 battery. So you can change them after an hour . The bike was everything I expected and more. More than enough power very smooth and quiet. This is a whole lot of bike for the price tag.